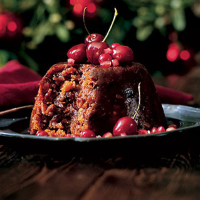 Packed with exotic fruits steeped in fresh orange and brandy, this Christmas pudding contains no heavy suet so is wonderfully light in texture. If you prefer to use different fruits to those in the recipe, just make sure that the total weight is about 500g. Garnish with fresh fruit - we've used cherries and pomegranate seeds. Generously butter a 1.2-litre pudding basin and line the bottom with buttered foil. Chop the mango, prunes and apricots into small pieces, the size of a sultana. Place these and the remaining fruits into a large plastic box or bowl, pour over the brandy, orange juice and zest, mix well and cover. Leave overnight so that all the liquid is absorbed. Tip the fruit into a large mixing bowl and add the remaining ingredients, taking care that the butter is soft but not oily, and beat until smooth. Spoon the mixture into the prepared pudding basin. Cover with a pleated piece of buttered foil (the fold in the foil allows for expansion) with the buttered side towards the pudding. Push the foil down around the edges of the basin and tie in place with kitchen string, to ensure no steam can escape. Make a string handle so that it is easier to lift the hot basin out of the pan. Place the basin in a steamer above water or stand on a rack in a saucepan. Pour water into the pan so that it comes half way up the basin. Bring to the boil, then lower the temperature and simmer for about 5 hours for a light pudding or about 8 hours for a darker pudding. Remember to check the water level regularly as it will need to be topped up with hot water to prevent it from boiling dry. Allow the pudding to cool completely, then discard the foil and replace with a new piece. Store in the fridge or freezer until needed. To reheat the pudding on Christmas Day, steam or simmer in water for about 1½ hours until piping hot. Turn out on to a plate and garnish with fresh fruit, we've used cherries and pomegranate seeds. Serve with Waitrose Cointreau Cream or Waitrose Brandy Butter with Rémy Martin Fine Champagne Cognac. Mary Berry's new book Real Food - Fast, published by Headline, is full of uncomplicated recipes using fresh ingredients. The buttered foil in the bottom of the basin ensures that the pudding does not stick - simply remove before serving. If boiling the pudding rather than steaming, it is important to place the basin on a metal rack. This prevents the pudding from becoming overcooked at the bottom. Do not sit it on a plate or saucer as these can crack. The pudding can be prepared up to 2 months ahead. If freezing, thaw completely before reheating.